AutismWonderland: Racial Profiling and Autism: How Do We Keep Our Kids Safe From the George Zimmerman's of the World? Racial Profiling and Autism: How Do We Keep Our Kids Safe From the George Zimmerman's of the World? Last night as I listened to the Jury declare George Zimmerman not guilty of 2nd degree murder and manslaughter of young Trayvon Martin - I was heartbroken. As a parent, my heart ached for Tracy Martin and Sybrina Fulton. No parent should ever have to lose their child to such senseless violence. I sat on my sofa with tears streaming down my face - shocked that a young black man's life was of such little value in the state of Florida. Disgusted by the Stand Your Ground law and how one could hide behind it. We live in a country where citizens in most states have the right to bare arms, to stand their ground in the name of self-defense. We live in a country where Americans have easier access to guns than mental health. And we live in New York City where Stop and Frisk is practiced. In May of 2012, I wrote why I fear for young men of color with autism living in urban communities. Zimmerman's not guilty verdict does absolutely nothing to quell my fear, it simply exacerbates it. When The Boy was in kindergarten, his teachers made him walk down the halls with both hands in his pockets to keep him from flapping his hands. For years I've gone back and forth on whether or not The Boy should be free to flap. I've gotten to the point where I don't care if he flaps. I never asked him to have 'quiet hands.' Now I worry that his hand flapping will be the thing that makes him look suspicious. If he's walking down the street with his hands balled in his pockets or fidgeting with something - will it look like he's armed? Will his jerky awkward movements or high-pitched scripted speech deem him dangerous? I don't know how the laws will change or how autism awareness will increase. I don't know what The Boy will look like or be like in ten years. I don't know if he will be able to walk down the street alone. I want him to be independent. But if he is, I will fear for his safety. I fear how he will be perceived. I fear for any young man with autism...especially those living in a state like Florida. Children with autism have such a hard time picking up on social cues. They have difficulty understanding body language. How do I teach a kid like mine to be street smart? To be cautious and careful. Who will look after him, when I am gone? A few weeks ago, I was talking to someone about The Boy and I mentioned he had autism. Immediately that person brought up Sandy Hook. "Didn't the killer have autism?" she asked. I couldn't even believe that the Sandy Hook tragedy was the connection this person made to autism. I was telling her about my seven-year old son and she associated him with a mass murderer. It was unsettling. It worries me. This is why I write. This is why more men and women of color raising children with autism need to come out. This is why autism awareness is critical. 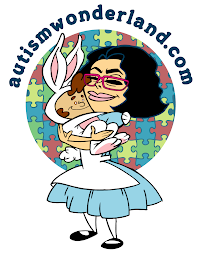 People need to understand what autism looks like - not only in children but in young adults. Police and first responders need to be trained to understand and recognize an individual with special needs. Trayon Martin did not have autism. He was just a boy, walking down the street and targeted as a threat. 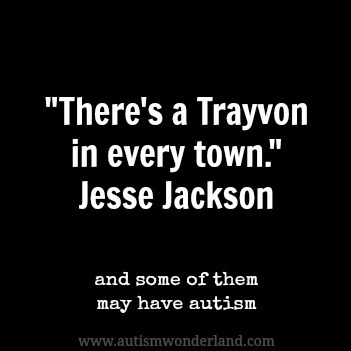 But there are many young men of color with autism, who walk down the streets in their neighborhoods. Will they be seen as a threat too? Will someone feel justified to gun them down in the street in the name of standing their ground? Eventually our young sons will grow into men. How can we keep them safe ?